For 85 years, Saint James the Apostle Parish has provided spiritual leadership and religious education to the Catholic population of Springfield and the bordering areas. 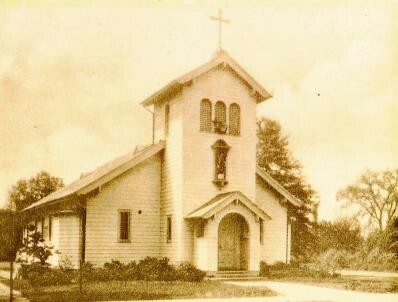 With the establishment of the Diocese of Newark in 1853, Saint James was originally a mission of Saint Vincent’s Parish in Madison, and then a part of Saint Rose Parish in Short Hills. Mass was being celebrated once during the week at the home of Daniel Coghlan in Springfield. After Saint Vincent’s erected a church in Morristown, Mass was said one Sunday a month in Mr. Coghlan’s home, along with Lenten devotions oneevening a week and catechism classes every Sunday for the children. According to a census taken in 1869, there were 18 families and 73 Catholics in Springfield. ed for $30 a month for this purpose. In July, 1924, the builder John J. Lamb of Summit was hired to erect a frame church on the corner of Linden and Morris avenues, currently the site of a bank. Bishop O’Connor appointed Father T. B. Larkin to the Pastorate of Saint James on June 15, 1925 and a temporary rectory was set up in a house at Morris Avenue and Alvin Terrace, in the Battle Hill area. That property was subsequently purchased in October, 1925 and remained the rectory until the move to the current property. By 1952 the need to build a school was evident and there was no suitable location near the current church and rectory, so six acres of property on South Springfield Avenue were purchased for $14,500. Two years later the Morris Avenue property was sold for $35,000. Ground-breaking ceremonies for the new church/school combination, a rectory and a convent were held on June 2,1952. On June 27, 1953, Archbishop Thomas J. Boland oversaw the laying of the cornerstone and led a procession into the new building, where he blessed the church, tabernacle and main altar. The first Mass was celebrated in the new church on June 28th, with more than 600 parishioners in attendance. Saint James School opened in 1952 under the direction of the Benedictine Sisters of Elizabeth. In 1979, the School Sisters of Notre Dame took over the management of the school. The Sisters of Saint Joseph later took on this responsibility, but the school is now completely staffed by lay teachers. There are now over 225 students in the school and 450 enrolled in the Religious Education Program. In January of 1998, Father Robert Stagg put together a Vision Committee to study the needs of the parish, which led to the decision to build a new church. A Capital Campaign was launched in 1999 and ground was broken on June 16,2001. The new church was dedicated on June 6, 2002. The parish membership now consists of approximately 1800 families. As of July 2006, Monsignor William Hatcher has been Pastor of the parish, with the able assistance of Father James Worth as Associate Pastor. The parish continues to be a thriving community of active parishioners, who support over 50 different pastora ministries.